Photos courtesy Kelly Lynch A crowd welcomes steam locomotive No. 765, operated by the Fort Wayne Railroad Historical Society, to Chicago's LaSalle Street station last June. More than 2,500 passengers – from 30 states – made the trip. 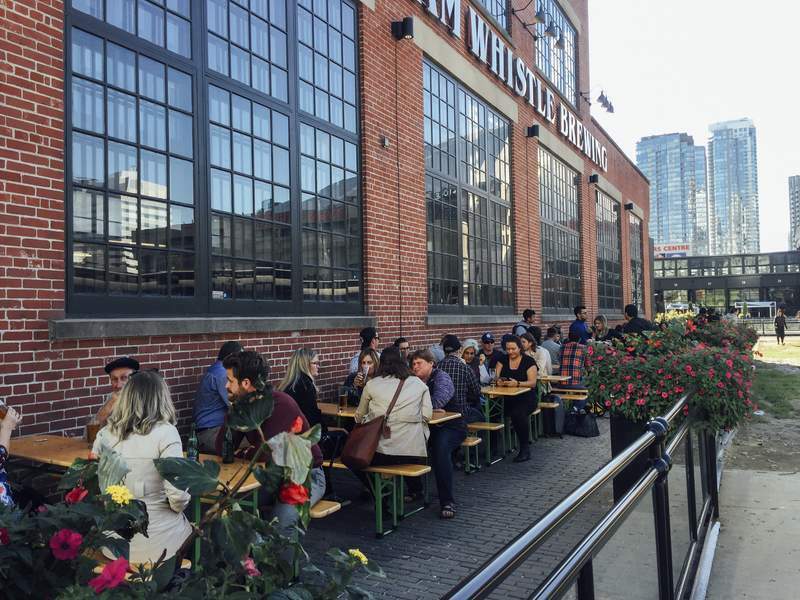 Visitors enjoy an October afternoon on the patio at Steam Whistle Brewing, one of the businesses to open adjacent to Toronto’s Roundhouse Park. 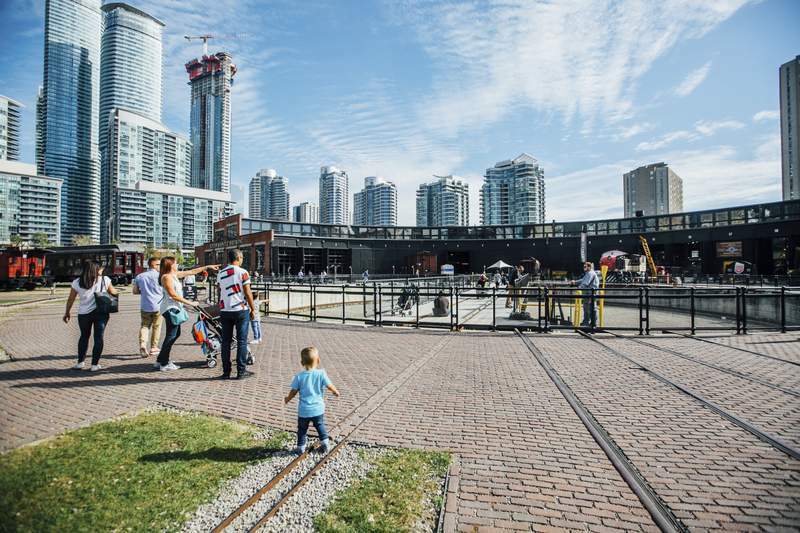 Families gather near the fully restored and operational locomotive turntable at Roundhouse Park, a 17-acre park in downtown Toronto. Photo courtesy Kelly Lynch Toronto’s Roundhouse Park, operated by the Toronto Railway Historical Association, includes a museum and miniature railway. When supporters of Parkview Field championed their vision for a baseball park downtown more than 10 years ago, they didn't necessarily do it for their love of the sport. They did it in pursuit of creating a community gathering space for connectivity and experiences. This decision infused our burgeoning urban core with opportunities, recreation, entertainment and a new destination. It was about creating a happening. That thinking has altered the course of the community's development ever since. In short, it was never just about baseball. As Phase 1 of riverfront development and the construction of Promenade Park began this year, it followed the same logic. It's not just about being on or in the water, but creating a destination. While the riverfront plan paints a grand portrait of the city that Fort Wayne will become, for many the questions persist: What will be built there? Where can I take my family? Will it be open in the winter? Developed as a major new tourist attraction in the early 2000s, Roundhouse Park was part of Toronto's revitalization of its waterfront. 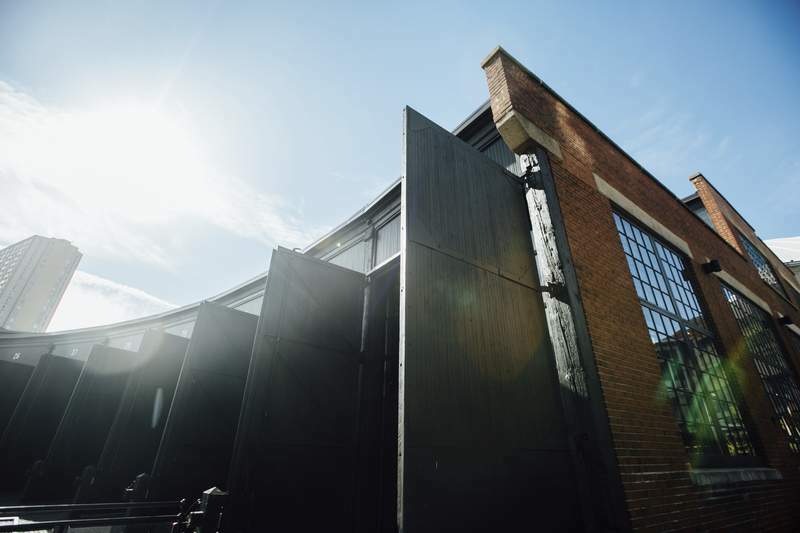 With its massive windows and characteristic exposed brick-and-timber construction, the 1930s-built semicircular structure sits at ground zero of the city's entertainment district and hosts a brewery, restaurant, arcade and a railway preservation organization as tenants. Tourists and millennials drank up samples and ate outside at the brewery. Families explored the vintage trains as visitors snapped selfies aboard them. Dancers filmed themselves performing against the backdrop of the city. Nearby, people from a birthday party took a ride on the roundhouse's 120-foot turntable – the steampunk version of a Lazy Susan – and crowds gathered for the miniature train trip around the park. The history and culture may have been secondary to many visitors, but for them it was enough that Roundhouse Park was just an interesting place to be. As a part of riverfront development, Fort Wayne's own Roundhouse Park hasn't arrived yet, but it's building steam. Known as Headwaters Junction, the proposed railyard park project has as much to do with Fort Wayne's railroad heritage as it does with having the perfect ingredients to create a vibrant and vital destination in downtown Fort Wayne. Prominently placed within the 2015 riverfront conceptual plan, the project has earned endorsements and accolades for its potential to keep the city's riverfront active year-round. In 2016, a feasibilitystudy backed by Steel Dynamics, the Schust Foundation and the Greater Fort Wayne Community Foundation revealed that the project could bring an additional 140,000 visitors to downtown Fort Wayne and generate $60 million in economic impact, with more than 15,000 visitors projected in the winter months. These numbers would be impressive for any venue as a part of riverfront development. While Fort Wayne doesn't count a roundhouse among its preserved buildings, it isn't lacking in the attractions. Now in its 45th year of operation, the Fort Wayne Railroad Historical Society's restored 1940s steam locomotive No. 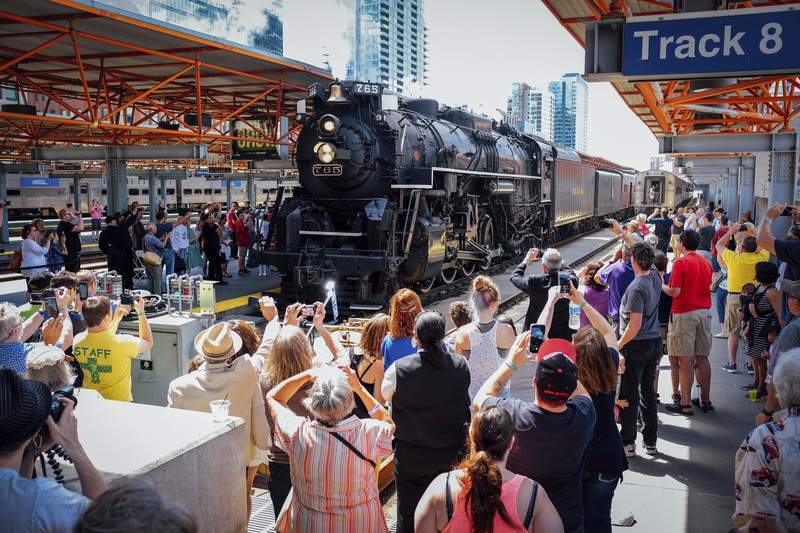 765 has become a world-renowned celebrity, operating sellout excursions throughout the Midwest to passengers from all 50 states and several countries, offering thousands of riders and visitors the chance to experience something more magical than your average train ride. 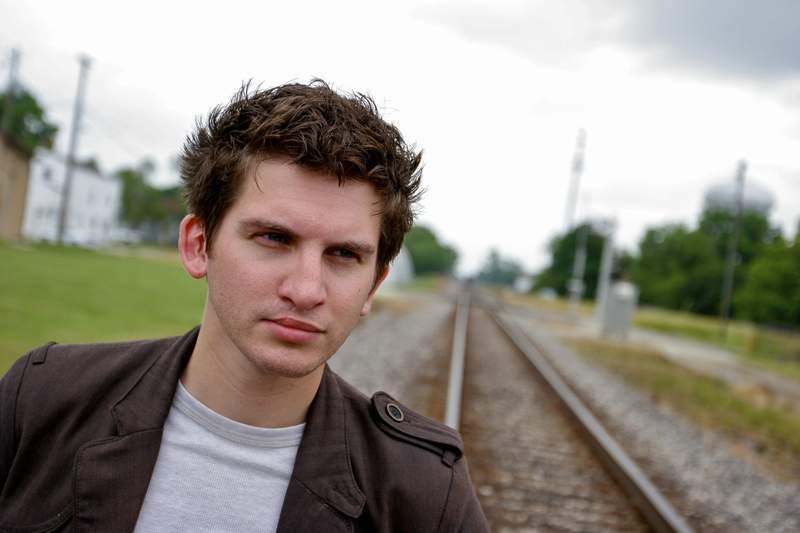 Last September, Miller City's schools in Ohio canceled classes for an hour just to watch the locomotive go by. Next month at its modest facility in New Haven, the Railroad Historical Society will greet 5,000 passengers aboard the 16th annual diesel-powered Santa Train. Having these artifacts – and the dozens of annual events that a railroad attraction would invite – hidden near the state line is no way to celebrate and share this history, let alone create a destination out of it. Next to Promenade Park, it's the only specific riverfront project that's been announced and one that will bring thousands more to the continued mixed-use developments in downtown. It even includes a train ride between the Fort Wayne Children's Zoo and the riverfront. As we look to the redevelopment of the General Electric campus, the bones for greatness are already there. For the riverfront's biggest attraction, the fossils have already been brought back to life – now they just need a place to thrive. In many ways, the logic behind it is not at all dissimilar – and just as unusual – as moving a baseball field downtown. While the proposed Headwaters Junction will certainly be about trains, it will be as much about railroading as Parkview Field is about baseball. It's not hard to imagine the experiences, connections and memories for which a project like this will set the stage, let alone the tax revenue from riders and visitors who will participate in them.